Hello. welcome to the Jay Rosenblatt Guitar blog. My last post was mid-February. Now its the end of September 2015. Time flies. I currently am preparing to exhibit my guitars at the Woodstock Luthiers Invitational Showcase in Woodstock, New York, on October 23rd., 24th., and 25th., 2015. I will have a table there exhibiting my instruments and will also have my guitars played in performance by Frank Sole and Henry Nerenberg. Two excellent musicians who will perform onstage at 4:00 pm., Saturday, October 24th, 2105. Frank Sole and Henry Nerenberg will be performing at The Woodstock Luthiers Invitational playing Jay Rosenblatt Guitars Saturday, October 25th., 2015 @ 4pm. 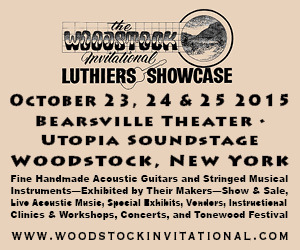 The Woodstock Luthiers Showcase is a feast for the eyes and ears and displays the works of over 60 talented luthiers, makers and instrument builders. Friday is the day to see the instruments and marvel at the guitars on display. Saturday and Sunday feature full day performances by the best pickers and musicians performing on the handmade instruments being exhibited. A must attend event if you love guitars and guitar music. 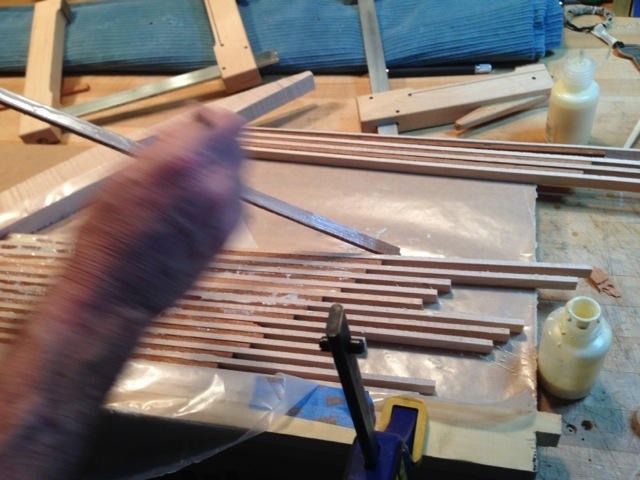 My last blog post detailed construction of a Weissenborn Lap Steel guitar. This instrument has been completed and delivered to its new owner. Since that posting I submitted the photographs of it construction to Guitarmaker Magazine along with an article on how I built it. “Guitarmaker Magazine”is the publication of A.S.I.A., The Association of Stringes Instrument Artisans. The publisher, Alton Acker, reproduced the images and article as the featured story. The magazine can be purchased through the A.S.I.A. web site where you can also sign up for a membership which includes 4 yearly publications and information about seminars and luthier events and other services they provide to the guitar builder and entheusiast. http://asiartisans.org/content/. 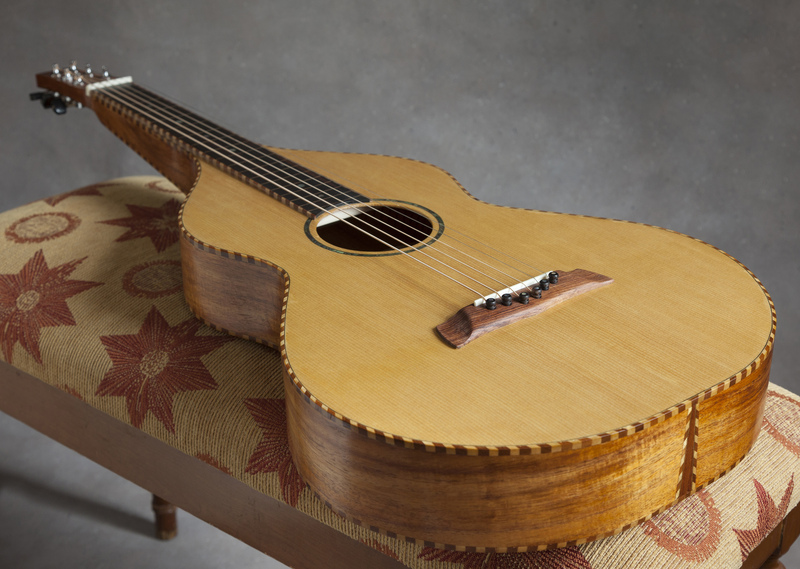 Weissenborn Guitar by Jay Rosenblatt featured in GuitarMaker Magazine. The A.S.I.A symposium 2015 . A previous post highlighted a Mahogany Venitian Cutaway guitar. on-the-guitar-building-workbench-2015. Since that post that instrument has also been completed. The finish was a hand rubbed French polish. I used a medium-dark amber on the back, sides and neck and a light blonde on the soundboard. The finish produced a wonderful sheen on the African Mahogany back and spruce top and enhanced the organic feel and look of it. This instrument will be exhibited for purchase at The Woodstock Luthiers Invitational. Recently of the bench and completed is this Rosewood and Sitka PF model. The photos below show it just after it came out of the finish shop. This guitar features a beautiful set of reddish brown rosewood matched to an Alaskan Sitka soundboard. The neck is laminated from 40 year old mahogany with a maple center strip. 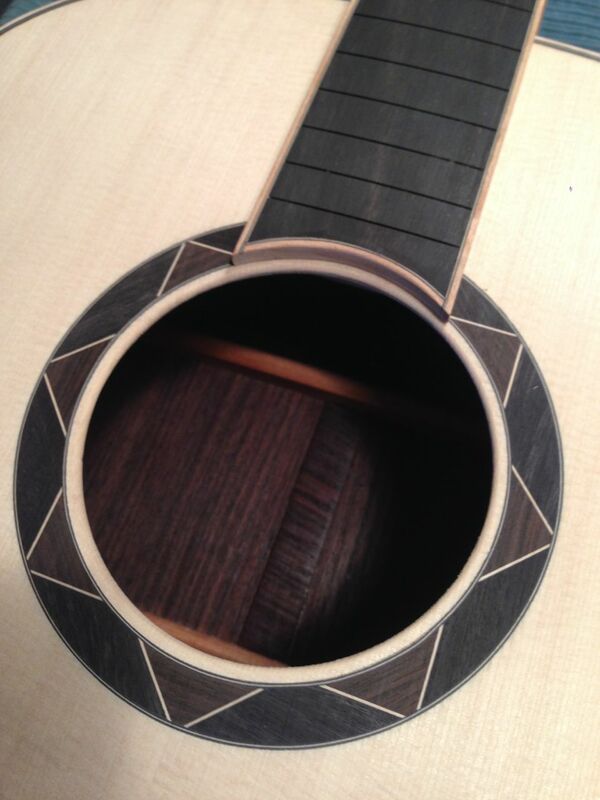 It has an ebony fretboard bound in maple with triangle position markers and my geometric rosette in ebony and maple. The head plate is Cocobolo with a maple binding and the first guitar to have the Rosenblatt name inlaid into the headstock. The guitar has had a shellac tone coat and a lacquer finish applied. This instrument will be featured at The Woodstock Showcase and is for sale. Please inquire! The guitar that Jack Built. This summer I had a young guitar student take a class with me to learn guitar building. He preformed all the steps necessary with my guidance and constructed a beautiful Mahogany and Sitka guitar. Having never used woodworking tools before he did quite well and had the dexterity of a future woodworker. The guitar featured a mahogany neck with rosewood fingerboard and a rosewood bridge. He also cut and installed a whale motif headstock inlay. The instrument was built over a month, two to three 5 hour classes per session. At this point the guitar is at the finisher getting a Notrocellulose finish. Should be a beauty that he will enjoy for many years to come. Other projects around the shop include two sister Kasha style Classical guitars. Working with Frank Sole, musician and builder to construct these instruments, we have completed all the building forms and have crafted and carved the neck, heel and headstock . The soundboard bracing is in progress. Ill update as it moves along. A little experimentation. 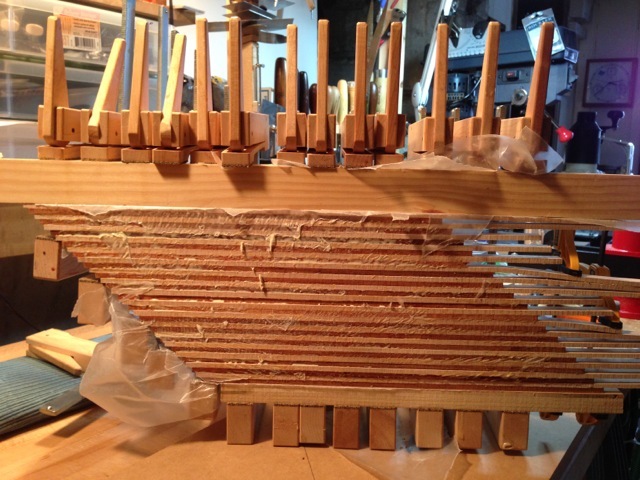 I have been playing with some experimental bracing patterns on a cutaway in the works. Inspired by the Arches in Utah I will assemble this in a manner where no two braces actually touch each other, yet pass through and over/under each other allowing more flexibility through the top. This will not be available currently on any model untill it is time tested and proves to be a worthy design. This is an experimental design. Experimental bracing design by Jay Rosenblatt. All rights reserved!! Please look for my next post. I will be highlighting and describing the guitars I will exhibit and have for sale at The Woodstock Luthiers Invitational Showcase. This week began a Weissenborn project. Based loosely on a style 3, this page I will highlight photographs of its construction. I will update it as I move along its completion. This is a special build with a delivery date of Mid April. About the woods: This was constructed with Koa back and sides and an Alaskan sitka soundboard. The fingerboard is Macassar Ebony and came from LMI. The headstock is Mahogany which came from a 3×3 billet from Hibdon Hardwoods. The bridge of Honduran rosewood was also from Hibdon. The binding is a traditional Rope design made from scraps of maple and mahogany. The head plate is Koa. The pearl rosette was from the Duke Of Pearl. Ebony bridge pins with Abalone inlays were used and the position markers are Abalone too. The Koa back and sides came from Notable Woods in Lopez, Washington. These are age dried pieces of Koa with a nice tone and appear to be very stable. The Sitka soundboard is of salvaged wood from Alaska Specialty Woods, Craig Alaska. The story behind the soundboard is that it came from a bridge stringer that once spanned over Back Bear Creek. It was a 63″ diameter log that was aquired by the mill in 1998, about 2 years after the bridge was pulled to be replaced replaced with steel bridge. The wooden car bridge was installed when the road there was used for logging in 1984-85. Now that road is used for recreation and to get to a hydro electric generator were water falling off the mountain from black bear lake is run through a turbine. The build is based on a template from Waldon Instruments. I have modified my braces to suit my building style. February 9th, 2015, Weissenborn template arrived from Waldron Music to be used for body and rough bracing dimensions. All photography © Jay Rosenblatt, Jay Rosenblatt Guitars. The Alaskan Sitka spruce top plates were jointed and joined together using clamps and weights to make a nice tight center line. Although those clamps look big I use very light pressure on them. An abalone rosette was installed with contrasting black fibre. This abalone came from the Duke of Pearl. Tha back was patterened and thicknesses to about .095. The bracing for the back was cut and installed using go bars method. The braces war carved, bridge plate installed and are ready to meet the instrument sides. To aid in the assembly of the two plates to the sides an open ended form was constructed. The headsotck which attaches to the top, back and sides of the instrument can be held in place as it is clamped to the body. 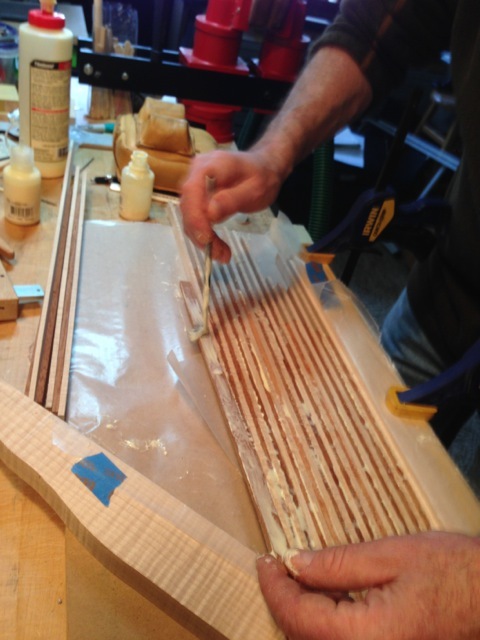 In preparation for the binding, traditional rope binding is made by laminating (here) strips of maple and mahogany together. 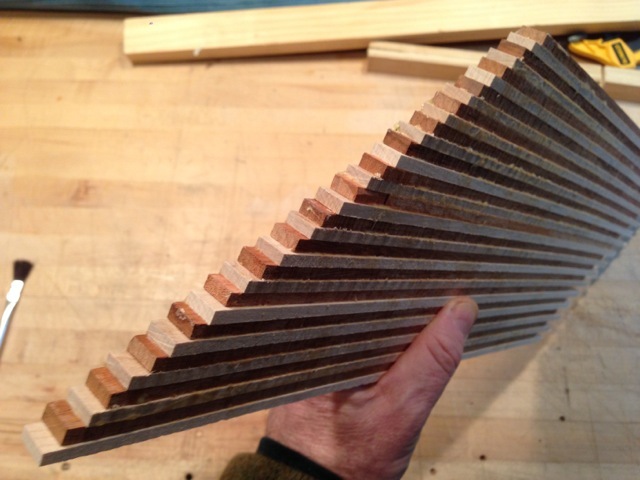 These will be sliced diagonally into thin strips which will be installed as binding around the instrument and around the fingerboard and headstock. The side plates have been dimensions and brought to a thickness of about. .085. These will be hand bent on a bending iron. The sides are bent and cooling in the form awaiting the tail and headstock assembly and kefing. The Weisssenborn headstock is cut from one piece of Mahogany with a book matched set of Koa head plated attached. Kerfing being installed in the Weissenborn. A simple end graft is constructed from mahogany and rope binding and fit in a slot cut into the tailpiece. When I removed this guitar from the form I noticed something unique to the instrument. When I tapped on the center of the soundboard, sort of a thump with my thumb, I was able to hear the sound that produced come out not only from the sound hole but I also heard it way up in the headstock. The vibrations traveled straight up through the hollow neck and emitted at the top of the guitar. I have a little music box mechanism that plays a simple tune very quietly when you crank the handle. Barely audible without something to amplify its sound, like a wooden music box. I place it where at the bridge position to test the guitars responsiveness to a very quiet sound, essentially making the guitar the music box. (try it one day) The sound is greatly amplified and comes through the sound hole. When I put the mechanism at the top of the neck the sound transversely traveled down and out the sound hole almost as loud as from the bridge position. I am certain that the energy from the nut will also travel through the guitar and add to the sound of this instrument. Perhaps thats is little secret behind the Weissenborn’s unique sound. February 23, 2015 The rope binding on the soundboard side is complete. I have begun the finishing the body in preparation for the fingerboard and bridge, This is getting a hand rubbed shellac finish (french polish}. The back and sides Amber, 2 lb cut, and the top, Med-Dark Blonde, 1 LB cut. In this photo you can see the shimmer of the wood which is typical of KOA. This photo is also very close to the real color. Rope binding and Abalone dots are added to the fingerboard. After sanding this fingerboard is only about 3.5mm thick. 3/7/15 The fingerboard is glued in place and clamped. The bridge made from Honduran Rosewood. Carved to be similar to the original design, attached with hide glue. The initial stringing sounds awesome. I used John Pearse Weissenborn strings, 80/20 bronze, 15 to 60. A final adjustments for string height and level across the tops will be performed, but as it is this Weissenborn has a rich tone, a beautiful natural reverb, good presence and response, and a lovely character. Thanks for looking. I hope you have enjoyed reading this as much as I have enjoyed building it!